This is a Rollei SL66E shot and I'm disappointed to say it's a scan of the Adox 50 CHS Art negative and not, as I'd hoped, of a print. The gremlins that struck my Durst L1200 enlarger before I could even do a single print with the machine have yet to go away - the buggers. I'm working on it but in the meantime I've no choice but to upload neg scans. I love the light that floods through the inside door when the main front door has been left open. The chair doesn't usually stand there - that would be really stupid! - but I plunked it the middle to give the scene a focal point. I mounted the camera on a tripod for this one - one of the great things about shooting round the house is that I can spend as much time as I like setting things up - and used the 40mm Distagon, equivalent to roughly a 24mm lens on the 35mm format. As usual, the film was developed in Barry Thornton's high definition two-bath formula and all the highlight detail is readily available. The door at the end is etched glass and, despite a fairly large contrast range in the scene, none of the detail in the glass has been lost. The taking aperture was f11 and the shutter speed - hang on a minute 'til I check out the exif information - was around 1/4 second. The Distagon is a nice sharp lens as you'd expect and seems to be very distortion free -take a look at the edges of the door frames and wall. Very little was done to this picture after scanning it. I adjusted the levels by a small amount and that was it, I think. I'm going to return to this shot from time to time and might play with other objects in the centre. For the next shot, I'm going to have the chair closer to the lens for a little extra wide-angle perspective, stretching the nearest legs out towards the camera. I assume you metered your frame with an external meter (incident maybe?). Could you please explain to me in a few words how exactly you measured? I always have second thoughts when dealing with this kind of backlighting... i use most of the times a gossen lunalite incident meter. Thanks for dropping by! 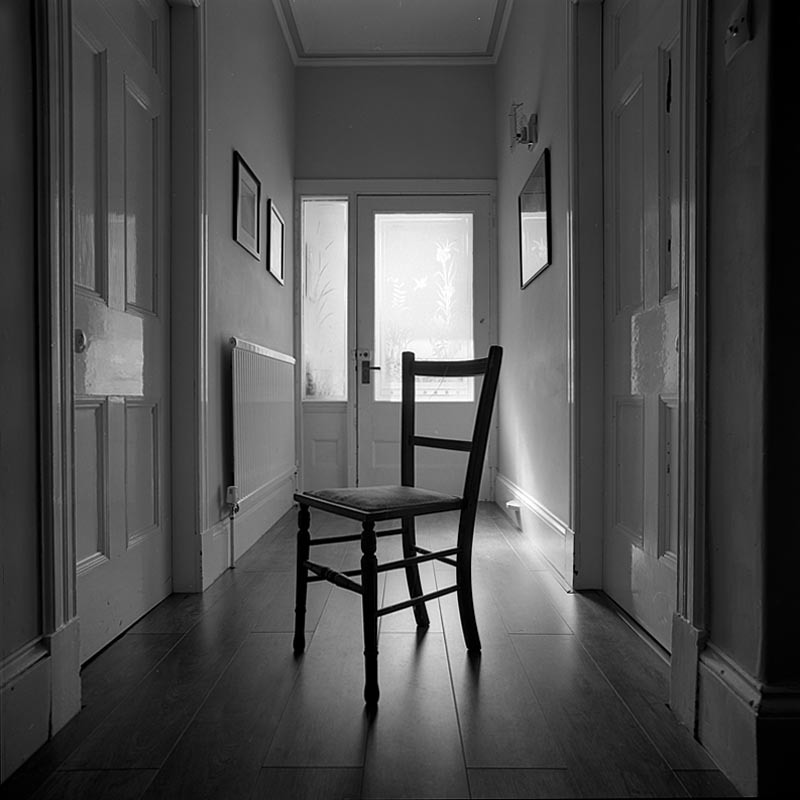 I wanted to make sure the chair was a nice, dark shape whilst at the same time retaining as much detail as possible in the light coming through the door. I used a spot meter (I've got a Sekonic Digilite L-318B with a spot attachment) up close to get a zone five reading for the chair frame and closed the shutter down two stops to put it on zone three. That meant it would be dark but with a little bit of detail so not a pure silhouette. I then metered the window to see where the highlights would fall. I can't remember where that was now (I don't take notes) but I thought the two-bath developer would stop them blowing out and that proved to be the case. I also took an incident light reading and a reflected light reading off the door and split the difference and it wasn't very different so I thought I must be in the ball park. Hope that helps. I very much enjoyed looking at your old Blogger blog, btw. You're very creative. Where did you get the chemical's to mix up Barry Thornton's 2-bath developer?